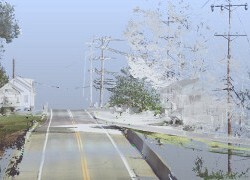 Hampton Technical Associates, Inc. is now offering forensic 3D laser scanning and surveying services to the municipal, legal and insurance communities. Services include forensic mapping and reconstructions of crime, accident and fire scenes for municipal fire and law enforcement agencies and private industry investigators. Our 3D scanning technology accurately collects and compiles complex scene data that is used to support and substantiate an eyewitness or an expert witness testimony. HTA, Inc. operates as part of the investigative data documentation team assisting attorneys, experts, fire and police officials when developing case causation theories and scenarios. 3D laser scanning uses laser technology to produce detailed 3D images and digital photographs of complex environments and geometries in only minutes. The resulting image is an assembly of millions of 3D measurement survey points (x, y, and z point data) or “Point Cloud” that documents the shape of objects in incredible detail. In addition to representing an image of the site or object scanned, each of the “Point Cloud” dots represent survey grade accurate points between which extremely detailed measurements can be calculated for the basis of design, construction, visualization or evaluation. 3D laser scanning optimizes field data collection and eliminates the need for expert investigators and survey teams to revisit the site. This in turn enables our clients to save time and money when conducting forensic investigations and retail surveys.